After years of consumer warnings and frightening health reports, artificial trans fats in food are going away. In June, the U.S. Food and Drug Administration's ban on trans fats, removing them from food in restaurants and grocery stores, went into effect. This was after the agency's 2015 determination that trans fats were unsafe to eat because they raised harmful cholesterol levels and contributed to heart disease. The World Health Organization has called for a global elimination of artificial trans fats in foods by 2023. Trans fats were widely used in margarine, snack foods, and baked goods because they didn't spoil as quickly as other fats and because they enhanced the texture of these foods. But weren't trans fats once thought to be a healthful alternative to saturated fats? It turns out that scientists and health professionals got that one wrong. 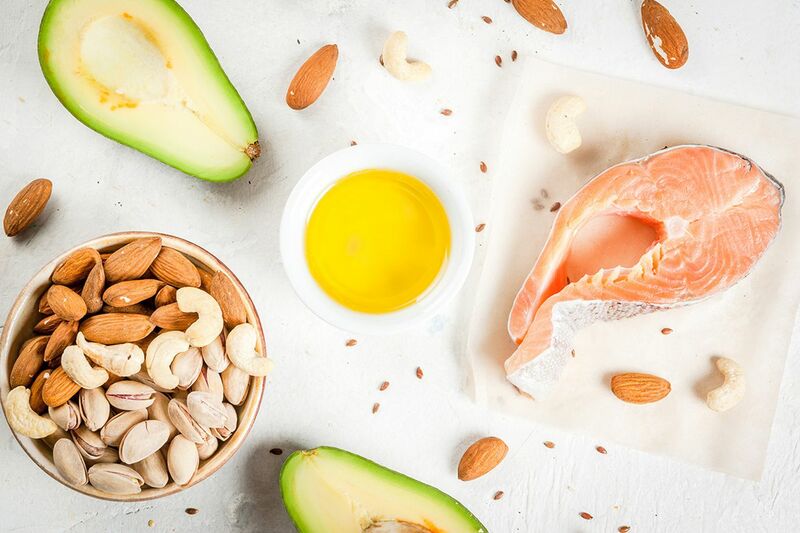 To get the latest on good fats and bad fats, we spoke recently to Janine Kyrillos, a clinical assistant professor and obesity medicine physician at Thomas Jefferson University. She also is director of Jefferson's Comprehensive Weight Management Program at Bala. Janine Kyrillos, director of the Jefferson Comprehensive Weight Management Program at Bala. Let's start with a quick review of good fats and bad fats. My approach to good fats and bad fats is that good fats are naturally occurring fats, ones that you can easily find in nature. That includes animal fats, eggs, cheese. And fat that you can easily extract — like olive oil. You can mechanically press olives and easily express the oil. Vegetable and seed oils, like soy and corn, are not easily extracted without high temperatures and chemicals. Those oils end up being less stable in our bodies. They also have high levels of omega-6 fatty acids. Too much omega-6 can cause inflammation and increased risk of heart disease. So even though the American Heart Association recommends corn oil, I don't agree. It's all very complicated. That's why it's safer to stick to foods as close to their natural state as possible. Basically, you can't fool Mother Nature. The problem started when we decided that saturated fats were harmful. We needed to replace them with something, and trans fats seemed healthier. But we were wrong. We're starting to see that the data linking saturated fat to adverse heart health was incorrect. Up until about 100 years ago, animal fat was the only fat Americans ate. Oil back then was a lubricant and not edible. The first edible oil in the U.S. was cottonseed oil. They started using it for filler in some commercial food items. Eventually, Procter & Gamble made Crisco, which is crystalized cottonseed oil. It's right in the name: Cris-co. Procter & Gamble used the proceeds to make a major donation to the American Heart Association, which helped the association get on its feet. A hundred years ago, there was very little obesity, diabetes, or heart disease. Granted, people died earlier for other reasons, so some might say they died before they could develop diabetes or heart disease. But not necessarily. Today, we're seeing kids with Type 2 diabetes and obesity. So what happened is, back in the 1970s, based on incomplete science, we declared that fat, especially saturated fat, was bad. We recommended low-fat diets, and people switched to carbs. Producers removed the fat from food and replaced it with sugar, because otherwise it tastes like cardboard. Obesity and diabetes skyrocketed. How are fats processed in our bodies? Basically, there are three types of food. Carbohydrate, protein, and fat. When we eat carbs — sugar or starch, including sweets, bread, pasta, cereal — our body converts them into glucose. So when we eat them, our blood sugar goes up. Immediately, our bloodstream is flooded with insulin. Insulin's job is to get that sugar out of our bloodstream. Insulin takes that sugar and makes it available as energy. But if we don't need that energy, it's stored as fat. So think of insulin as the fat-storage hormone. When we eat protein, our body uses some of it, but extra protein gets converted to glucose. So protein also stimulates insulin, but not as much. Here's the good news: When we eat fat from meat, fish, eggs, cheese, nuts, avocado, olive oil — we don't stimulate insulin. So we're more likely to use the fat than to store it. And we feel more satisfied because blood sugar isn't going up and down so rapidly. What are the implications of the actions by the FDA and the WHO? The implications economically are that companies have to find other ways to stabilize their food, ways that are cheap and healthy. The question is, are we going to come up with something that is equally unhealthy? Are we going to make another similar mistake? Essentially, we're trying to find ways to preserve food. But if we go back to real food – plant-based or animal-based — you don't need that. Real food, most of us would agree, is the healthiest option. You are an advocate of the ketogenic diet. What is it? The extreme version of the low-carb, high-fat diet is a ketogenic diet. People on that diet eat less than 20 grams of carbs a day. That equates to a small banana or half a bagel. In contrast, the standard American consumes about 200 to 300 grams of carbs. With the ketogenic diet, your body burns fat instead of carbs or glucose. The byproduct is ketones, which can be used for fuel instead. Ketogenic diet is not for everyone. It takes an extra degree of determination and diligence. Depending on where they are starting, I may try to get people to eat less than 50 to 100 grams of carbs daily. But, it has tremendous value for people with diabetes and pre-diabetes. It's really been miraculous in some of my patients. People that couldn't lose weight or control their blood sugar, even following all the advice their doctors and dietitians gave them, are now losing weight, stopping medications, and feeling great. There's a growing medical movement — not mainstream yet – that advocates treating diabetes with a ketogenic diet. The research is promising. We're seeing a lot of great, new studies. Also, we're re-evaluating old studies and realizing we didn't look at the whole picture. Hopefully, this means that we're going to see big changes in the dietary recommendations. It may take some time to shift long-held beliefs. But I think you're going to see a return to a more natural diet, a higher-fat diet, and we're going to realize that in the past 40 years we've been sidetracked. What are some quick and dirty tactics people can employ to have better diets when it comes to fats? Eat real food. Food that was around hundreds of years ago. Food that your great-grandparents ate. Stay away from the processed carbohydrates, and now processed fats. You shouldn't have to depend on a label declaring that something is natural; you should be able to see that it's natural. If it spoils, if it goes bad, then it's probably not processed, although it would have been good to eat it a few days earlier.